While the best mirrorless camera models are catching up, full-frame DSLRs have long been the cameras of choice for photographers in pursuit of optimum image quality and performance. And these days, a number of very different models can be bought at a reasonable price (especially with some of the best cheap camera deals we've ever seen). So which is the best DSLR with a full-frame sensor right now? We think the best full-frame DSLR right now is the Canon EOS 6D Mark II, which offers a brilliant balance of price versus features and is perhaps the best Canon camera of all for keen enthusiasts. Compared with APS-C and smaller image sensors, full-frame sensors enable individual pixels to be physically larger, so they can gather more light. This gives the potential for relatively noise-free images, even at high ISO settings. Alternatively, camera-makers can pack full-frame sensors with more megapixels for brilliant rendition of fine detail and texture. Full-frame cameras also allow for a much tighter depth of field for portraiture and still-life photography – giving a beautiful 'bokeh' backgrounds that make your shots look truly professional, if you use with fast wide-aperture lenses. Here are the best full-frame DSLRs for your attention, updated with the latest top models from Pentax, Canon and Nikon. It’s taken Canon six years to update the original 6D, but the Mark II is well worth the wait. 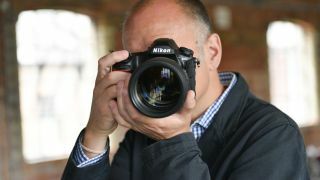 While both editions deliver sumptuous image quality, the new version adds a raft of handling improvements, as well as boasting a higher megapixel count and late-generation processor. Key upgrades include two new autofocus systems, the main AF module having 45 phase-detection points which are all cross-type. The older camera only had 11 AF points with one cross-type sensor. For live view and video, autofocus is much faster thanks to the Mark II’s Dual Pixel AF image sensor, which enables hybrid phase/contrast detection. One slight niggle for viewfinder-based shooting is that the AF points only fill a fairly central region of the frame, and the viewfinder itself doesn’t give full 100 per cent frame coverage. However, the new fully articulated touchscreen looks great from any angle and works a treat for selecting AF points on the fly, and for navigating the intuitive ‘Quick’ menu. Further enhancements include a sportier maximum burst rate of 6.5fps instead of 4.5fps, 5-axis stabilization for movie capture, and the addition of NFC and Bluetooth to the existing Wi-Fi and GPS. All in all, the Canon EOS 6D Mark II is a stunner. And of course, if you want a cutting-edge alternative, the new Canon EOS RP is a mirrorless version of the 6D Mark II. The EOS 5DS R is virtually identical to the older EOS 5D Mark III in external appearance and handling, which is no bad thing. Canon has, however, redesigned the newer body to be more rigid yet slightly lighter, and there’s a new shutter unit that reduces vibrations. For capturing detail and texture, the EOS 5DS R is simply epic. Indeed, some of Canon’s own EF lenses didn’t make it onto the approved list for use with this camera because they’re not sharp enough to do it justice. The trade-off is that high-ISO images are relatively noisy, and it's presumably for this reason that Canon has limited the standard ISO range a maximum ISO 6,400 setting, so it's not necessarily the best option if low-light shooting is your thing. The model was launched alongside the more affordable EOS 5DS, which is largely the same model, save for the fact that the effects of its optical low-pass filter are not cancelled out (whereas here, they are, for better detail). The EOS 5D Mark IV’s sports Canon's latest-generation sensor and builds on the bones of the EOS 5D Mark III in a number of key ways. The metering system and 61-point autofocus module are updated, for example, with all of the AF points supporting f/8 lens-teleconverter combinations. Live view autofocus is also excellent, thanks to Canon's Dual Pixel CMOS AF system. Weather-seals are also improved, while a new touchscreen speeds you through menu choices, and Wi-Fi, NFC and GPS have all been added. It may not quite be the best 4K camera, thanks to a heavy crop factor and the somewhat inefficient Motion JPEG format, but the 5D Mark IV still produces excellent results when it comes to video. Image quality is unquestionably great, with high-ISO images managing to be more detailed than those from the EOS 6D yet equally free from noise. While it lacks the second card slot, the Canon EOS R is otherwise a mirrorless version of the 5D Mark IV. The Nikon D610 is still the cheapest full-frame Nikon DSLR, and if you don't need the latest features it's well worth considering. Sure, it may not have all the fancy tricks of the D750 (below) such as a tilting screen or Wi-Fi, but you still get a 24.3MP full-frame sensor, two card slots, Full HD video and a (fixed) 3.2in LCD. Image quality is excellent and the autofocus system works very well, despite the fact that it's not quite the newest module Nikon offers. The D610 would be a great first-time, full-frame camera, or alternatively a capable backup body for a more advanced model. For all-round abilities, the D750 has established itself as our favourite Nikon DSLR. The 24MP sensor includes an optical low-pass filter to protect against moiré patterning and false colour, and this is coupled with an EXPEED 4 processor, while the body is finished with tilting rear screen and dual card slots. On the inside, Nikon has furnished the camera with a 51-point AF system, Wi-Fi and the option to shoot at up to a very respectable 6.5fps High-ISO image quality is about as noise-free as the Canon EOS 6D, but the D750’s 51-point autofocus system is streets ahead. Image quality is sumptuous in all respects, and overall performance is spectacular considering the camera’s relatively low price. This is arguably the best-value Nikon DSLR you can get right now. It's hard to think of a camera that's made as much of an impact as the D850 in recent years, and it certainly has some strong competition. Whereas most DSLRs have either high-resolution images or speed and sensitivity as their priority, the D850 manages both, with its 45.7MP sensor, 7fps burst shooting mode and the same 153-point AF system that won many fans when it first featured in the D5 heading up a long list of impressive specs. With great 4K video that makes this regarded as the best camera for filmmaking by some users, along with superb build quality and all the customization you need, and you can see just how much it's likely to appeal to a landscape photographer as it might a wedding or event shooter. Right now, perhaps the only mark against it is the fact that Nikon also has a number of excellent full-frame alternatives that cost a little less, such as the compact D750 and the D810 that it replaces. Still, if it the latest tech, versatility and quality of both stills and video you're after, right now there's nothing else like it. Pentax usually goes the extra mile when it comes to build quality. The K-1 Mark II feels typically robust, solid and dependable, and features a full set of weather-seals. The megapixel count is impressive at 36.4MP, and the tilting rear LCD is similarly high-res, but it’s not a touchscreen. Going one better than some of the latest Canon DSLRs, the Pentax has a 5-axis sensor-shift image stabilization system that works for stills instead of just for movie capture. Not just for beating camera-shake with any attached lens, the stabilization system has advanced modes for anti-aliasing correction, and for enhancing the capture of fine detail. This is based on shifting the sensor by tiny amounts through a series of four exposures, to create a super-high-resolution image. There’s also an ‘astrotracer’ mode, which employs the built-in GPS module, electronic compass and horizontal/vertical tilt sensors, along with the stabilization system, to stop heavenly bodies appearing to streak across the sky in long exposures. By contrast, the sensor-based autofocus for live view and movie capture is relatively poor, and movie resolution tops out at 1080p. For stills, the full-frame burst rate is a pedestrian 4.4fps. However, this rises to 6.4fps in APS-C crop mode, which also boosts the effective reach of telephoto lenses, albeit with a drop in megapixel count. Bigger and beefier than the A7R II compact system camera, the A99 II is, strictly speaking, not a DSLR, but close enough in design and intentions to be considered alongside them. It offers more assured handling and feels better balanced with most full-frame lenses. There’s a hybrid autofocus system but, unlike that of the A7R II, it includes phase-detection on both the image sensor (399 points) and a separate AF module (79 points). Five-axis sensor-shift image stabilisation features, as does a 2.36MP OLED electronic viewfinder, while the rear screen offers full articulation rather than just vertical tilt. The camera also boasts blisteringly fast 12fps continuous shooting, complete with autofocus tracking and live metering. In recent years Sony's attention has shifted away from its SLT bodies to its A7 and A9 compact system camera lines, and this places the future of the system in doubt. Still, while it may not be the best Sony camera full-stop, for now we like the A99 II – a lot.